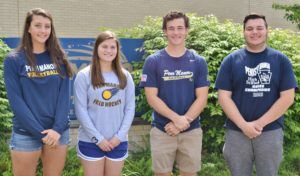 The top athletic awards went to Collin Whiteside and Morgan Edwards, recipients of the All-Around Male and Female Athlete awards, and Zach Bowers and Emily Robb, named the Outstanding Penn Manor Male and Female Athletes. Collin Whiteside was captain of the baseball and soccer teams and a Section 1 first team All-Star in both sports. His coaches praised him as a team leader who was humble on and off the playing field. Morgan Edwards was captain of the lacrosse team and co-captain of the volleyball team her junior and senior years. Despite missing most of her senior volleyball season as a result of injuries, she was awarded the team’s Most Improved Player Award. Emily Robb received multiple honors as a member of the field hockey team. She was named to the L-L League All-Star, first team All-State, and All Academic teams and the National Academic team. Her coach praised Emily as a team leader and role model for younger players. Zach Bowers helped the bowling team compile a 77-14 regular season record and was a major contributor to the team’s state championship. He was named L-L League Section 1 Most Valuable Player and earned an average score of 216 for the season. 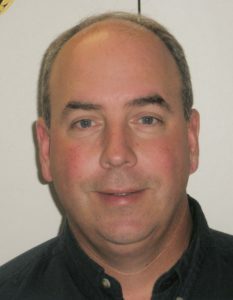 Also honored May 16 was Comets softball coach Dave Stokes, named Penn Manor Coach of the Year. Stokes led the team to a 20-3 record and a spot in the District 3 playoffs. From left, Morgan Edwards, Emily Robb, Collin Whiteside, Zach Bowers.